Making your own baby food is a huge money saver not to mention a healthier option than jarred food. I have made my own baby food for both of my boys. The only equipment you need is a blender or food processor, a few ice-cube trays and some Ziploc bags. Last weekend I made green beans, avocado and banana and butternut squash. 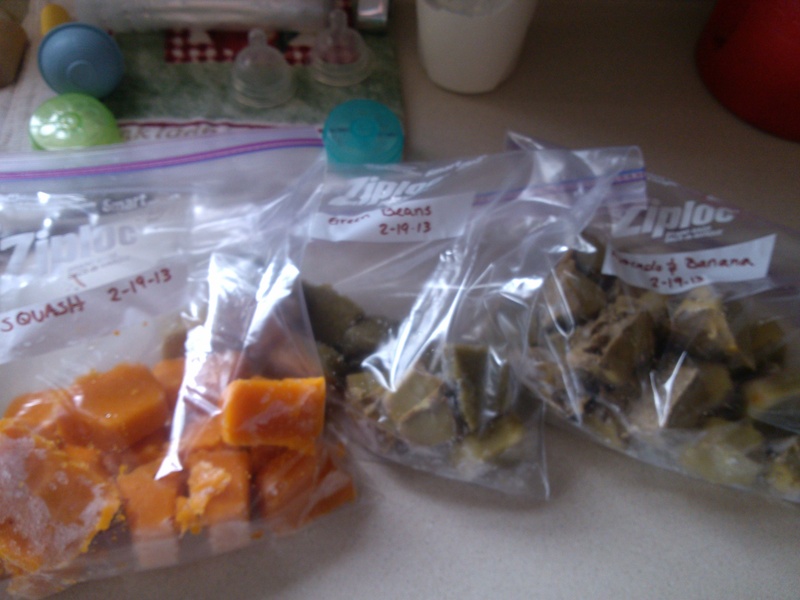 It took me a total of 1 hour and then a few minutes to pop the frozen baby food cubes in freezer bags. Now I have a month’s worth of meals for my little guy. Peel and cube squash. Place in water, boil until tender. Cool and puree in blender or food processor. Divide into two ice-cube trays. Freeze. Puree banana and avocado. Add formula or breast milk until desired consistency is reached. Divide into one ice-cube tray. Freeze. Drain green beans, puree. Divide into one ice-cube tray. Freeze. This entry was posted in Baby, Food. Bookmark the permalink.